All the wrestlers above have profiles on Joshi City, you can click their names to go straight to it. The entire card is not Sendai vs. Stardom, as this is more of a normal opener. Kimura is a Freelancer that frequently wrestles in Stardom, while Sareee hails from Diana. Alex Lee is a Freelancer but wrestles in Stardom a lot, while Nagashima is a Freelancer as well that bounces around to different promotions. So no real storyline going on here, just a match to warm up the crowd. Looks like this match is joined in progress, which I am perfectly ok with. I know I complain about it sometimes but only if it is an important match, openers being clipped isn’t a big deal. We pick things up with Sareee and Lee in the ring, Lee tags in Nagashima but Sareee gets away and tags Kimura. Nagashima and Kimura trade boots, Lee comes back in to help but Kimura pokes them both in the eyes and hits a double facecrusher. Lee schoolboys Kimura from behind for two (is she legal? ), Kimura is double teamed again while Sareee watches, as Lee hits a jumping knee. Tilt-a-whirl DDT by Nagashima, then Lee hits a tornado DDT. Chokebomb by Lee, but Sareee breaks up the cover. Sareee hits a German suplex on Lee, big boot by Kimura and she hits another one on Lee for the three count! Kimura and Sareee win the match. There wasn’t much to this one, between it being clipped and most of the action being meddling. Some of these wrestlers are good but none really got a chance to shine, which is a bit of a shame but this show is about the big main event and I have my doubts that any other match will be memorable on this card. Another random wrestlers type of match, at least on one side. Ray and Hirota are certainly not a regular team, as Ray is a serious talented wrestler while Hirota mostly does comedy shtick. Matsumoto and Garrett were not a regular team until a few weeks ago, but have been teaming recently in Stardom. This is going to be a major styles clash and I am not sure exactly what to expect. We join this one as Matsumoto is beating on Hirota (thank goodness it is clipped), and Matsumoto applies a crab hold. Hirota eventually gets to the ropes to force a break, but Garrett comes in the ring and puts Hirota in the Muta Lock. Ray breaks that up, and we jump ahead in the match to Ray and Matsumoto being in the ring together. German suplex by Ray and she tags in Hirota. Hirota grabs Matsumoto’s arm and runs up the corner, she walks the ropes but Matsumoto crotches her to knock her back to the ring. Hirota drops Matsumoto into the ropes and gives her the Oil Check, tiger feint kick by Ray and Hirota hits the half hatch suplex for a two count. Garrett comes in to help and hits a superkick on Hirota, backdrop suplex by Matsumoto and she picks up the three count! Your winners are Garrett and Matsumoto. I said that I was glad it was clipped because Hirota comedy gets old to me pretty quick, so the shorter the match the better. Nothing against the other wrestlers but any match with Hirota in it just kinda becomes her style of match. But this was too short to even get an opinion on, I enjoy both Ray and Matsumoto quite a bit but they did very little here. Safe to skip, although that Oil Check was vicious. This is a 6 vs. 6 Elimination Match. Each team starts with one wrestler in the ring, when a wrestler is pinned the next wrestler from that team comes in. This is repeated until a team is out of wrestlers. There is a ten minute time limit for each pairing, so if the time expires then both wrestlers are eliminated and the next two come in. There is no time limit if the contest comes down to just two wrestlers. Now that I got the rules out of the way, this is a big match as it is rare to have any promotion or factions battle that feel this important. The teams are pretty even, as both teams range from the best in the promotion to a couple less experienced wrestlers, so it balances out. I’m excited about it, let’s see how it plays out. Hashimoto immediately picks up Watanabe and puts her in the corner, Irish whip by Hashimoto and she hits a body avalanche. Watanabe comes back with a dropkick and hits another one, cover by Watanabe but it gets a two count. Hashimoto gets Watanabe to the mat and puts her in a leg submission, but Watanabe inches to the ropes to force a break. Watanabe goes off the ropes and hits a few dropkicks, but Hashimoto picks her up and hits a scoop slam. Another slam by Hashimoto and she covers Watanabe for two. Watanabe elbows Hashimoto but Hashimoto elbows her back and they trade blows. Reverse STO by Watanabe and she hits a vertical suplex for a two count cover. Watanabe nails the Somato, but Hashimoto barely gets a shoulder up. Watanabe goes for a crossbody off the second turnbuckle but Hashimoto catches her and slams Watanabe to the mat. Hashimoto deadlifts Watanabe back up and slams her again, and this time she gets the three count cover! Momo Watanabe is eliminated and Sendai Girls’ is winning the series 6-5. Mimura comes in next for Stardom, she takes it to Hashimoto as soon as the bell rings, finally knocking her down with a series of dropkicks. Back up, spear by Hashimoto and she applies an armtrap headlock, Hashimoto picks up Mimura and applies a backbreaker before dropping Mimura to the mat. Fireman’s carry rolling slam by Hashimoto, she picks up Mimura and she hits a second one, but Mimura sneaks in a crucifix pin for a two count. The La Magistral gets the same result, dropkicks by Mimura but Hashimoto hits a judo throw and slaps on the cross armbreaker, forcing Mimura to tap! Mimura is eliminated, and Sendai Girls’ is up 6-4. Wolf is the next wrestler down for Stardom. Wolf snapmares Hashimoto and kicks her in the back, but Hashimoto blocks her kick and applies a headlock on the mat. Wolf gets out of it but Hashimoto applies a full nelson, Wolf reverses it but Hashimoto quickly gets out of it. Kick by Wolf and she knees Hashimoto into the corner, kick to the back by Wolf and she covers Hashimoto for two. Wolf goes to the second turnbuckle but Hashimoto grabs her from behind, Wolf wiggles away however and hits a dropkick. Wolf goes up top but Hashimoto avoids the dive and she delivers a Waterwheel Drop for the three count! Wolf is eliminated, and Sendai Girls’ is now up 6-3. 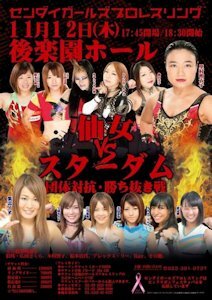 Shirai is the next Stardom wrestler to try to beat the dominating rookie. Hip attack by Hashimoto but Shirai kicks her when she goes for a second one, Hashimoto fires back with a series of hip attacks and covers she covers Shirai for two. Irish whip by Hashimoto but Shirai hits a dropkick out of the corner, she gets on the second turnbuckle and delivers a missile dropkick. She hits another missile dropkick, cover by Shirai but it gets a two count. Shirai applies a double underhook, Hashimoto gets out of it and hits a rolling shoulder powerslam for two. Hashimoto picks up Shirai but Shirai gets away and kicks Hashimoto twice in the head. Double underhook facebuster by Shirai, she tries to go up top but Hashimoto grabs her leg. Hashimoto charges Shirai but Shirai flips out to the apron and hits a missile dropkick off the top turnbuckle. Double knee by Shirai in the corner, she goes up top and she nails the moonsault for the three count! Hashimoto is eliminated, Sendai Girls’ is up 5-3. Shirai draws another Sendai Girls rookie, the young Iwata. Iwata is fired up but Shirai absorbs her blows, Shirai returns fire with elbows but Iwata hasn’t given up and elbows her back. A dropkick by Iwata finally sends Shirai to the mat, she picks up Shirai but Shirai blocks the dropkick, kicks by Iwata but Iwata pushes her to the mat and applies a crab hold. Double knee to the back by Shirai and she hits a standing moonsault before applying a sleeper, camel clutch by Shirai but she releases the hold after a moment. Shirai kicks Iwata into the corner but Iwata moves when she charges in and kicks Shirai in the chest. Dropkick by Iwata and she puts Shirai in a leg trap chinlock, but Shirai makes it to the ropes. Scoop slams by Iwata, she picks up Shirai and she hits a vertical suplex for a two count. Iwata tries to kick Shirai in the back but Shirai catches it, Iwata gets away from Shirai and she hits a bodyscissors roll-up for two. Kick to the back by Iwata and she kicks Shirai in the head for another two. This is fantastically fun by the way, I’d love to see them wrestle a longer match at some point. Iwata picks up Shirai but Shirai grabs her and hits an Air Raid Crash. Dropkick to the head by Shirai, she picks up Iwata and hits the package German suplex for the three count! Iwata is eliminated and Sendai Girls’ is up 4-3. They trade strikes to start their pairing, Sachiko knocks Shirai out of the ring and goes after her, but Shirai throws Sachiko into the crowd. Vertical suplex by Sachiko on the floor, and back in the ring Sachiko starts working on Shirai’s back. DDT by Sachiko and she hits another one, German suplex hold by Sachiko but it gets two. Sachiko goes up top but Shirai gets her knees up on the diving body press attempt, Sachiko stays in control at first but Shirai front flips away and hits a dropkick. Sachiko falls out of the ring, Shirai goes to the apron and hits an Asai Moonsault down to the floor. Back in, swandive dropkick by Shirai followed by the tiger feint kick, she goes for another swandive move but she falls off and crashes to the floor. Sachiko goes out to get her and brings Shirai back in the ring, but Shirai hits a scoop slam and this time connects with the swandive bodypress. Shirai goes up top but Sachiko headscissors her back to the mat and hits a jumping DDT. Superkicks by Sachiko and she hits a German suplex hold for two. Sachiko goes up top and she delivers the diving body press, but Shirai kicks out of the cover. Mounted elbows by Sachiko and she applies the sleeper, cover by Sachiko but it gets a two count. Palm thrust by Shirai and she kicks Sachiko in the head, tombstone by Shirai but Sachiko gets a shoulder up on the cover. A German suplex hold by Sachiko gets the same result, superkick by Sachiko and she hits a suplex hold of her own. They quickly trade pins and submissions as the time is getting close, but neither can get the win before the bell rings. The match is a draw, and both wrestlers are eliminated. Sendai Girls’ is leading Stardom 3-2. The two rivals are the next two wrestlers in for their teams, they roughly feel each other out until Satomura kicks Hojo into the corner. Spinning chop by Hojo and she charges Satomura, hitting a spear and then a rolling neckbreaker for two. Hojo goes for another spear but Satomura catches her and applies a front necklock. Spinning kick by Satomura and she covers Hojo for a two count. Satomura goes for the Death Valley Bomb, Hojo slides away and she hits the Sliding D to Satomura. A Wing Clutch pin by Hojo gets two, she goes up top and hits a diving elbow strike. Sliding D by Hojo in the corner, she goes up top again but Satomura recovers and joins her. Hojo knocks Satomura to the mat but Satomura delivers a high kick and re-joins Hojo, but Hojo knocks Satomura to the floor. Satomura gets back on the apron and kicks Hojo in the head, Satomura gets on the second turnbuckle and hits a superplex back into the ring for two. Kicks by Satomura, and she levels Hojo with a high kick. Cartwheel Kneedrop by Satomura and she applies the sleeper, but Hojo gets to the ropes. Satomura goes up top but Hojo gets her feet up on the diving body press attempt. Jumping footstomp by Hojo, she gets Satomura up and hits the Alabama Slam. Hojo goes up top and nails the beautiful diving elbow drop, cover by Hojo but Satomura gets a shoulder up. Hojo goes up top again but Satomura rolls out of the way this time, death valley bomb by Satomura but the pin attempt gets a two. She hits a second one, she tries to do a third but Hojo grabs her leg. While they struggle, the bell rings and the match is a draw. Both Hojo and Satomura are eliminated, leaving Sendai Girls with two wrestlers remaining and Stardom with one. The next two representatives come in, Chisako dropkicks Iwatani but Iwatani blocks the hurricanrana attempt and applies a crab hold. Snapmare by Iwatani and she kicks Chisako hard in the back, but Chisako slaps her and they trade blows. Chisako wins the battle and dropkicks Iwatani in the face, Chisako clubs on Iwatani and dropkicks her again before attempting a pin. Iwatani regains the advantage and dropkicks Chisako out of the ring, she goes up top and dives out after her but Chisako moves and she lands on Shirai instead. Opps. Chisako stomps on both of them before sliding Iwatani back in, dropkick by Chisako and she hits a missile dropkick for a two count. Another dropkick by Chisako and she hits a cutter, but Iwatani kicks out of the pin. Diving footstomp by Chisako, she goes up top and hits another one, but Iwatani bridges out of the cover. Superkick by Iwatani and she snaps off a release Dragon suplex, they both slowly get up and Iwatani applies a crucifix pin for two. Kick to the head by Iwatani, she goes up top but Chisako recovers and joins her. Iwatani knocks Chisako off but Chisako climbs back and hits a Frankensteiner. Diving footstomp by Chisako, cover, but it gets two. She goes up top again but Iwatani avoids the diving body press, cradle by Iwatani but it gets two. They trade quick pin attempts as the time is running low, but neither gets a successful pinfall. Back up they trade elbows, Northern Lights Suplex by Chisako but it also gets two. Back up, superkick by Iwatani, and she quickly hits the Fubukirana to get the three count! Chisako is eliminated, leaving the last two wrestlers. There is no time limit for the final pairing, the winner wins the main for their team. Due to Iwatani just having wrestled for almost ten minutes, Miyagi controls the early potion of the match, throwing Iwatani around the ring. Iwatani fights back and hits a split legged armdrag off the ropes, but Miyagi avoids the dropkick and she knocks Iwatani to the floor. Miyagi takes Iwatani into the stands and tosses her around the bleachers, Miyagi brings Iwatani back to ringside and slams her onto the floor. Miyagi gets a stick but the referee stops her, then Satomura takes the stick from her as she doesn’t want Miyagi to get DQed. Back in the ring, dropkicks by Miyagi and she hits a front suplex before applying a stretch submission hold. She picks up Miyagi but Iwatani hits two quick dropkicks, Miyagi throws Iwatani into the corner and she hits a jumping elbow. Face crusher by Miyagi and she kicks Iwatani in the head for two. Elbow drops by Miyagi and she hits a backdrop suplex, delayed vertical suplex and she covers Iwatani for another two count. Miyagi goes off the ropes but Iwatani catches her with a superkick, diving footstomp by Iwatani and she covers Miyagi for two. Iwatani goes up top but Miyagi avoids the bodypress, Miyagi now goes up top but Iwatani joins her and suplexes her to the mat. Crucifix slam by Iwatani, she picks up Miyagi but Miyagi blocks the dragon suplex and hits the ‘ol airplane spin. Miyagi goes up top and hits a missile dropkick, backdrop suplex by Miyagi but Iwatani kicks out of the pin. Miyagi hits three more but Iwatani fires back with the Sling Blade and they trade elbows as they slowly get up. Superkicks by Iwatani, she goes up top and she delivers a diving footstomp for a two count. Iwatani picks up Miyagi and she nails her version of the dragon suplex hold, picking up the three count pinfall! Team Stardom wins the match! Sometimes I call events a ‘one match card’ but this event was intentionally a one match card. The first few matches were pretty meaningless, or clipped to hell, as the six vs. six elimination match was what everyone came to see. I thought the match delivered in a lot of ways, it was unique in that each team had rookies and seasoned veterans so it wasn’t lopsided. Of the nine mini-matches, most delivered, with only a couple that didn’t seem to click. The important thing is that the match felt as epic as they wanted it to, with the teams staying down to cheer but with no cheating whatsoever, it was a clean match. The main event is worth a watch which by default means the show is worth it also, a solid effort by both promotions.